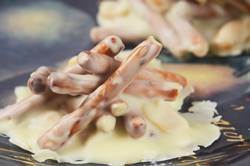 Just three ingredients are needed to make these White Chocolate Haystacks; white chocolate, peanuts and pretzels. White chocolate has such a sweet and subtle flavor that complements the saltiness of the peanuts and pretzels. Perfect for gift giving. White Chocolate has always been the mysterious chocolate, treated differently because according to the FDA, 'officially' it is not chocolate at all. That is because 'chocolate' must be made of cocoa fat (cocoa butter) and nonfat dry cocoa solids, an ingredient that is not found in white chocolate. So here we are, everyone thinks its chocolate, calls it chocolate, but its really isn't chocolate, its really "white confectionery coating". The one thing we must do is to choose our white chocolate carefully, making sure that the label states that it contains cocoa butter, sugar, milk solids, vanilla, and lecithin. White chocolate needs cocoa butter as this is what gives it that sweet yet mellow flavor and smooth and creamy texture. Inferior brands use vegetable fat as its substitute and their flavor is very sweet and artificial tasting. Another tell tailed sign its not good white chocolate is its color. White chocolate containing cocoa butter is pale yellow to ivory colored, whereas white chocolate containing vegetable fat is pure white in color. 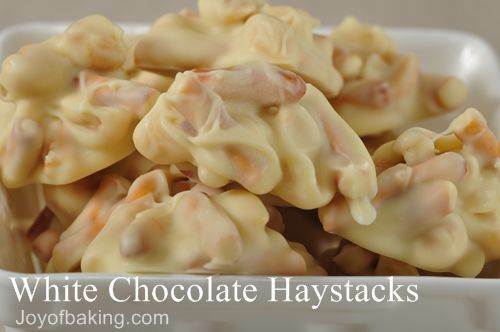 White Chocolate Haystacks: Line a baking sheet with parchment paper. Store the haystacks in an airtight container. They can be refrigerated for several weeks. Sorosky, Marlene. Season's Greetings. Chronicle Books. San Francisco: 1997.